Sussex Charmers - made from welfare assured cows, which graze on award-winning Sussex grass. A full-bodied cheese with that extra zing! 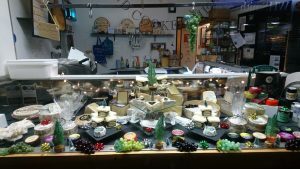 Brighton Blue - an award-winning cheese made in Sussex. A medium strength, semi-soft creamy blue cheese. Alsop and Walker Sussex Bries and Camemberts - creamy and earthy tasting soft cheese. Olde Sussex - an unpasteurised mature Cheddar style cheese. Mayfield Swiss - a full-bodied creamy Swiss type cheese made locally. Definitely one of our favourites! Sister Sarah - a semi-hard goat cheese which is fresh and zingy. Duddleswell - a waxy local sheep cheese which is perfect for a ploughman's with a difference. Two Hoots - Barkham Blue - a rich blue taste with a smooth buttery texture. British Cheese Awards Supreme Champion 2015. We also sell a wide selection of continental classics.